We have so much to tell you! With thanks to funding from the BIG Lottery’s ‘Awards for All programme’, we are delighted to introduce our “All in one Rhythm”project . This special project aims to use the FIFA World Cup in Brazil over June and July 2014 as a springboard to developing healthier, happier, more active citizens and a wave of positive community action across an area suffering rural poverty, economic downturn, a lack of public services, high youth employment and low esteem . Over the summer the Chantry Centre in Dursley will be bouncing to the beat of Brazil! As well as showing all the major games on the large screen, our ‘All in One Rhythm’ project will help make this World Cup an exciting family event even for those who don’t like football! On offer will be Community Fun Days, regular classes in samba drumming, dance classes and capoeira lessons, all building up to a wonderful carnival party to bring the full colour and energy of Brazil right here to rural Gloucestershire. All the activities will be family friendly and based around a Brazilian and World Cup theme. Thursday 29th May – FAMILY FUN DAY to launch and promote this project. Tuesday 24th June (evening event) – Watch ‘England V Costa Rica on the big screen at the Chantry Centre. Activities for the kids to enjoy too. World Jungle’s new friendship club, the Past times Café, in Woodfields, Cam is making a real difference to the lives of local residents and is fast becoming a social hub for the community. Since January 2014, older residents from across Cam Woodfields have been meeting each week at the friendship club which is based at the Woodfields Community Centre. Known as the Past Times Café, the club is run by Lisa Barnfield and Rosheen Windsor from World Jungle. As well as offering a friendly and welcoming place to have a cup of tea and a chat with friends, residents are also invited to take part in a range of activities. “The Past Times Café is all about breaking down barriers, combating loneliness and getting people together. The benefits to how you feel just by getting out of the house, having a chat with friends, or getting to try something new are huge. Activities that we have done include art, knitting, poetry, fitness, dance and raffles. Coming soon we have lots of new stuff including Tai chi, Nia Dance and Lindyhop! 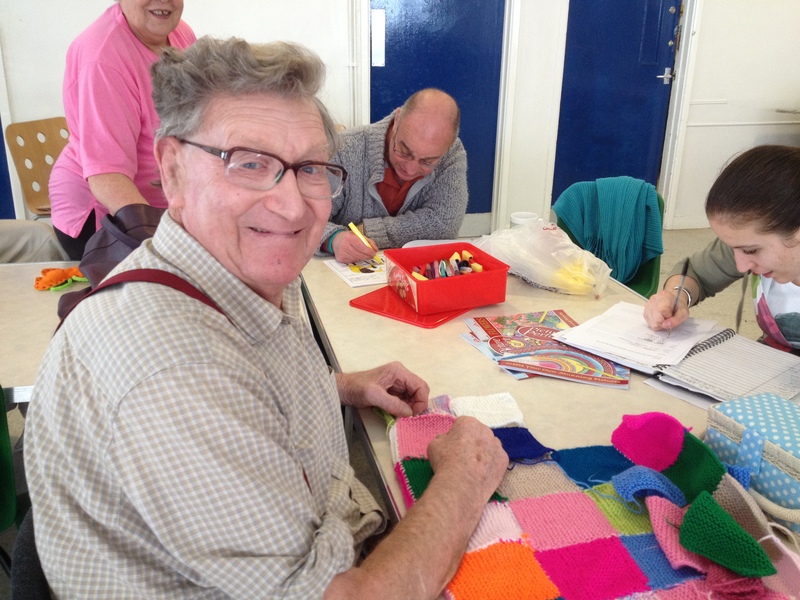 Some of the residents have used their time at the café to join together to work on a beautiful, hand crafted blanket. Feedback has been enormously positive and really demonstrates the importance of projects such as this in combatting loneliness and increasing the well-being of older residents within the community. The project is made possible with funding from People’s Health Trust using money raised by HealthTotal through The Health Lottery, and has so far been completely free for residents of the Cam Woodfields area to enjoy. Due to its popularity, it is hoped to extend the service by inviting people from other areas of Cam and Dursley for a small charge of £1 per session. The Chantry Centre needs YOU! Could you spare a few hours each week and help make a real difference to your local community? Trustees of the Chantry Centre in Long Street, Dursley, have joined forces with local community group, World Jungle, to help breathe new life in to the building so it can fulfil its potential of being a fantastic resource and venue for the local community to use. The Chantry Centre is located in the heart of Dursley and is home to the famous Lister Hall, a regular host of visiting bands, productions by the Dursley Operatic and Dramatic Society and concerts by Dursley Male Voice Choir to name but a few. High running costs have left the building in need of some work and volunteers are urgently required to get involved in a whole range of activities including DIY, decorating and design. “The Chantry Centre is full of so much potential, an amazing building just needing a bit of love and some hands-on hard work to give it a face lift! We are looking for people to volunteer their skills for an hour or so on Wednesdays from 10am-2pm and get involved in transforming the space. The project hopes to see the Chantry Centre become an active community resource which is used by all sections of the community throughout the daytime, evenings and over the weekend. If you would like to get involved please contact Mark Prowse at the Chantry Centre on 01453 542016 or email info@chantrycentre.org . Alternatively, contact Ben Ward at World Jungle on 07889 512644, email: info@worldjungle.org.uk Website: www.worldjungle.org.uk . Easter fun for children & young people in Cam Woodfields! 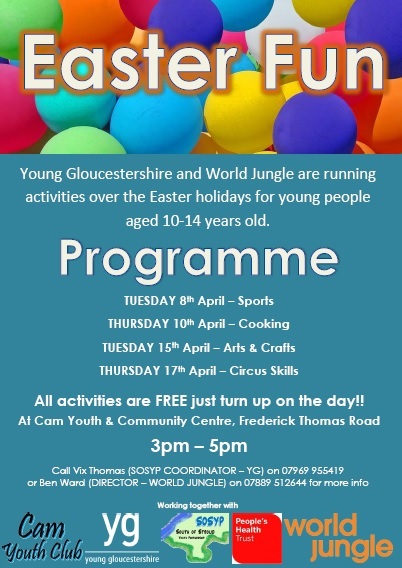 World Jungle & Young Gloucestershire are joining forces to run a number of fun activities for children and young people aged 10 – 14 years in Cam Woodfields at Cam Youth & Community Centre this Easter. All activities are free – and we are starting with a PARTY tomorrow night Thursday 3rd April 6 – 8pm .